Hope you got to enjoy last week’s total lunar eclipse. If you were wowed by the 2017 solar eclipse, the good news is that you have a chance to see another total solar eclipse on July 2, 2019. The bad news is that you will have to travel far to see it – either to South America or the South Pacific Ocean. There’s also an annular or ring eclipse of the Sun on December 26 for parts of the eastern Hemisphere. Venus is a brilliant “morning star” throughout the winter and spring. But, our planetary neighbor will spend July through October lost in bright solar glare on the far side of the Sun. Then in November, Venus will reappear in the evening, as it starts to move closer to Earth. Both Saturn and Jupiter will shine throughout the summer nights of 2019. Saturn’s spectacular rings are still tilted at a high angle to our line of sight, affording wonderful views through telescopes! If you’d like to see a planet crossing the face of the Sun, be sure to take in the solar transit of Mercury on November 11. This 2019 transit of Mercury will be the last planetary transit visible from Earth until November 13, 2032, and last one visible from Colorado until May 7, 2049! You’ll need a telescope with a safe solar filter to view this event. 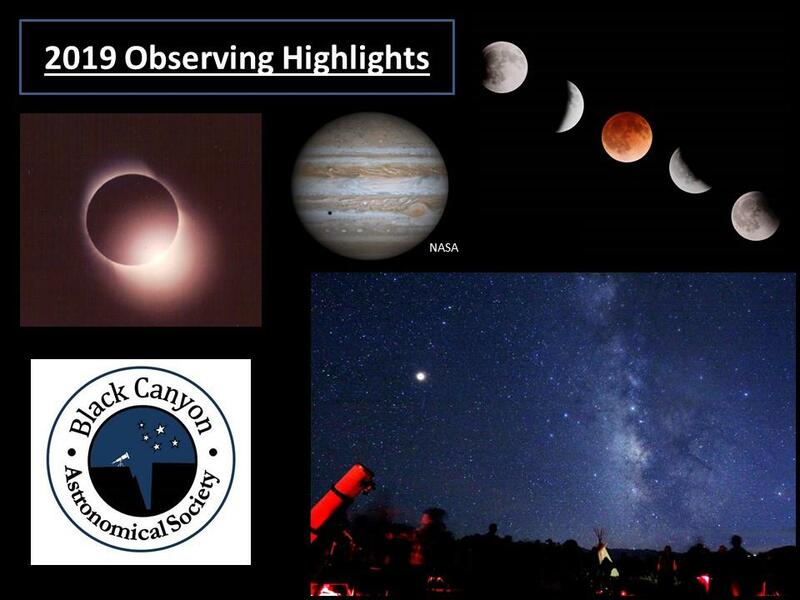 There are also some striking planetary conjunctions during 2019. Brilliant Venus and bright Jupiter are close together in the southeast before dawn during the remaining days of January. In the pre-dawn sky of February 18, Venus and Saturn will be less than 2 apparent moon diameters apart. On the evening of June 18 Mercury and Mars will be less than 1 Moon diameter apart. Bright Venus and Jupiter will again form a spectacular duo in the evening sky of November 24. To close out 2019, Venus and Saturn will pair up on the evening of December 11.